• Restore dead car batteries: On your long drive, you discover that your car batteries have given up and you are all alone trying to start your car. You may be able to restart your vehicle by just dropping two aspirin tablets directly in your battery. The salicylic acid in aspirin will combine with sulphuric acid to produce one final charge, sufficient enough for you to reach the nearest service station. • Treat Calluses: Grind five to six aspirin tablets and make a paste with lemon juice. Apply this mixture on the callus and wrap it with a warm towel. Allow it to stay for ten minutes and file the softened callus carefully with pumice stone. • Dandruff Check: Keep your dandruff under check by crushing two aspirins into a fine powder. Mix it with the normal amount of shampoo you use to wash your hair. Apply it to your wet hair and leave it for one to two minutes. Rinse thoroughly with water. Aspirin (Salicylic acid) is the main ingredient in most anti-dandruff shampoos. • Apply to insect bite and stings: Rubbing a wet aspirin tablet on an insect bite reduces inflammation and swelling. But, if you are allergic to bee stings and if you see symptoms like nausea or abdominal pain, then get medical attention immediately. • Self-Care: Few people are known to be allergic to aspirin, i.e the salicylic acid, which is the main component of aspirin. Such people should avoid medications and foods that contain salicylic acid. 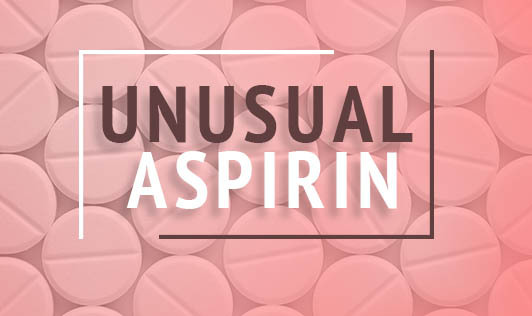 If you are allergic to aspirin (salicylic acid) internally, then you should avoid using it externally also.